Despite changes wrought through the years, the land of the Spicer ranch south of Kerrville, Texas, still blooms beautifully in spring. Along Upper Turtle Creek, this rain lily (Cooperia pedunculata ) might have tempted James Spicer (1856-1937) — artist as well as rancher — to reach for his canvas and paints. I have decided that I prefer white flowers. I received white fringed tulips yesterday, and placed them on a table containing a group of white orchids. They do make a statement. Indeed, they do. I love a field of bluebonnets or California poppies, and a nice cutting garden filled with snapdragons and zinnias is a delight, but even a single white flower exudes elegance. How timely. While driving home from the store this morning I noticed that some rain lilies had come up in response to last week’s showers. As much as you like white, I’ll bet you got some enjoyment from the maroon sheath. I certainly did enjoy that sheath, along with the tiny bits of maroon at the tips of the sepals. I don’t remember seeing such vibrant accents before. I found a few more lilies on that trip whose sheaths seemed even more deeply colored. Some were on the Willow City Loop, so they’ll pop up in my other blog one of these days. Oh yes, it’s a lovely beauty, and one that would make a nice study! Spicer would do the flower justice, I suspect. He had an interesting history. Born in London, he studied painting at the Institut de France and apparently was an accomplished artist. But he and his young wife eventually decided to trade Europe for Texas. He bought some land, and added to his resumé: he was the first to bring barbed wire to Kerr County. On the old English ranch up near Crosbyton, we knew one of the English boys and his family. This particular one made his home in an old XIT section bunkhouse that had been remodeled (plumbed and wired). The lady of the house (she was an avid birdwatcher, which is how we got to know them) used to get packets of mixed native Texas wild flower seeds and toss them out into the yard in front of the house. They never mowed nor infested the “lawn” with that anathema, Bermuda grass, and in the spring and summer it was a riot of wild flowers. Just gorgeous. It’s great fun to watch the seasonal flowers change. Once the bluebonnets and Indian paintbrush have gone to seed, the tourists go back to other things, but the flowers keep right on: coreopsis, Indian blanket, poppies, meadow pinks, all those pretty yellow things that I can’t keep straight. A yard filled with wildflowers is one of the prettiest sights in the world. Cemeteries, too, for that matter. One of the best places to find uncommon wildflowers seems to be a country cemetery: particularly one that isn’t too well tended. An absolutely beautiful photo. I love rain lilies but they have one fault, the bloom doesn’t last long enough. The ranch over near Kerrville sounds like a paradise to explore. Linda, for a northerner you have indeed found your home and way in Texas. Even though the blooms don’t last long, that’s part of the fun. It’s always interesting to see where and when they pop up. I was astonished to find some blooming on the Willow City Loop north of Fredericksburg, next to some very strange neighbors. More about that later. The ranch isn’t intact any longer — like so many, it’s been subdivided over the years. But the old home place still exists, in the hands of some historically-minded people, and the name endures on roads like Spicer Loop. Best of all, the land continues on, and what we see there today is what the Spicers would have seen a century and more ago. I like imagining that. There is something about a white flower that really draws me in. They look so very pure, especially against whatever background you might find them. This is lovely. Sometimes I wonder if my love of white flowers didn’t begin in childhood. We had pretty colored flowers around our house, like forsythia, tulips, and hollyhocks, but lily of the valley, spirea, hydrangea, and even the apple blossoms were so pretty. I’m glad you like this one — it’s something I’d never seen until the past five years or so, and it’s always a treat to find some. I don’t think I’ve ever heard of a rain lily, much less seen one! What a beauty! Did it get its name because it blooms after a rain? Does it have a gorgeous scent? Gee, maybe I’d better Google this one instead of bombarding you with questions, ha! That’s exactly how it got its name, Debbie. There are a couple of common species in Texas, and they pop up after rains. They can be a little unpredictable, but they’re fun to watch for. And a nice, large group of them does have a light, pleasing fragrance. Unfortunately, they don’t grow anywhere near you, so the best I can do is show you a picture — at least, until we get the technology to send along a fragrance, too. I don’t think there ever could be an excess of tulips, Tamara. I love them so — and grew up near a little Dutch town that had a tulip festival every year. As for the lily of the valley, lilacs, peonies — those are flowers I grew up with, too, and I miss them. But it’s great fun for me to see unfamiliar flowers from other areas of the country — or from other countries! — and I’m glad to have this way to share some of ours. I’m glad spring has come to you at last. Beautiful photo; the lily looks like a flute open to receive champagne at an elegant garden party. Spicer is a name well known to the media these days, but I couldn’t find anything about a James Spicer. Perhaps his story is coming in a future blog. I’m amused beyond words. I hadn’t made the connection between the name “Spicer” and current events. Perhaps I should pay more attention. On the other hand, perhaps not. I’ve been spending time on Spicer Loop for years, and know the people who purchased and restored the old house. His story might well arrive in the future — once I finish some of the other works in progress. I like your interpretation of flower-as-flute. I certainly felt as though I’d arrived at a counties-wide garden party on this trip. The variety and number of flowers was extraordinary. Despite the cloudy skies and irritating wind, it was a lovely visit, and of course there’s more to share. That is funny. I did hear this morning that a replacement for Mr. Spicer is being sought. If that’s true, we’ll have to find some new analogies. Yes, and I expect he would be quite happy to be out to pasture in the real Spicer Loop for a while, if he is replaced. Sean Spicer strikes me as more of a brassy tuba than a flute. Very nice photo! What a nice graceful, elongated vase this would make. It does have that Art Nouveau flare and flair, doesn’t it? Given its location, perhaps we could rename the nearby road and call it Flute Loop. Rain lilies are such a treat. We have a yellow one that’s native, too, and I like it just as much.Some others flourish here, both native and well-adapted from other parts of the world. Not only that — take a look at this post by a gardener in England. It’s full of information about the plants, and if you scroll down to the bottom photo, it shows one of our natives growing there! You could have one of your very own, growing in your newly designed yard! And now you’ve done it. 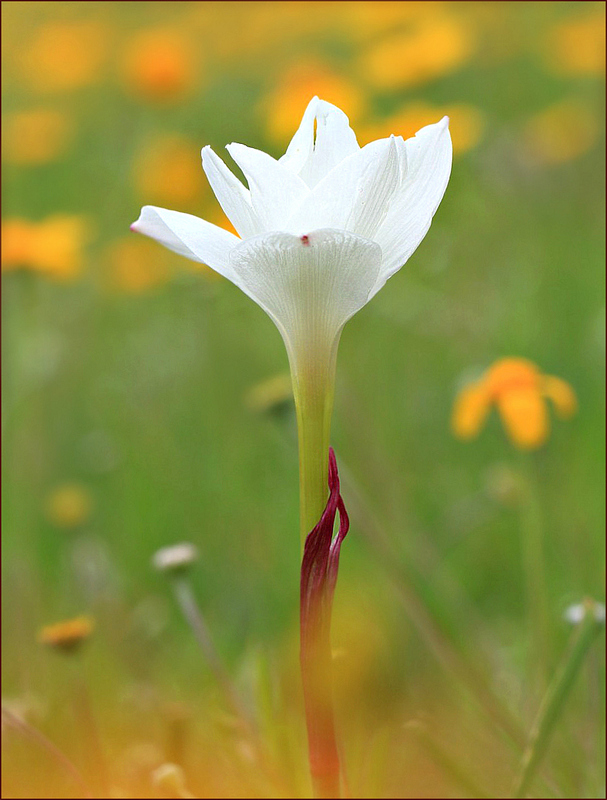 It seemed to me that if we have glacier lilies and rain lilies, there surely ought to be a desert lily. Well, I found it. Hesperocallis undulata I learned that it’s a monotypic genus — that is, it has a single species. It pops up in the Mojave, the Sonoran, and the Anza Borrego deserts, among others, but it’s limited to the western U.S. I want to see that flower! Isn’t it beautiful?